Recently I wrote about the average color of the universe, as determined by a survey of more than 230,000 galaxies. While knowing the overall color of these galaxies is a fun little factoid, it isn’t particularly useful from a scientific standpoint. However the color was determined by the average spectrum of the galaxies, which is quite scientifically useful. This “cosmic rainbow” tells us about the history of star formation in the universe. You can see the average spectrum in the figure below. One of the things you’ll notice is that isn’t simply a continuous spectrum. There are wavelengths that are particularly bright or dark. These are emission (bright) or absorption (dark) lines that are particularly common for the galaxies. Several of the lines are labeled by the element that causes the line. By looking at the relative brightness of these lines, we can determine the relative abundances and temperatures of typical stars. This is because young stars have hotter atmospheres than older stars, so the emission and absorption lines of a star changes over time. Given this average, you can fit it to models of historical star formation. 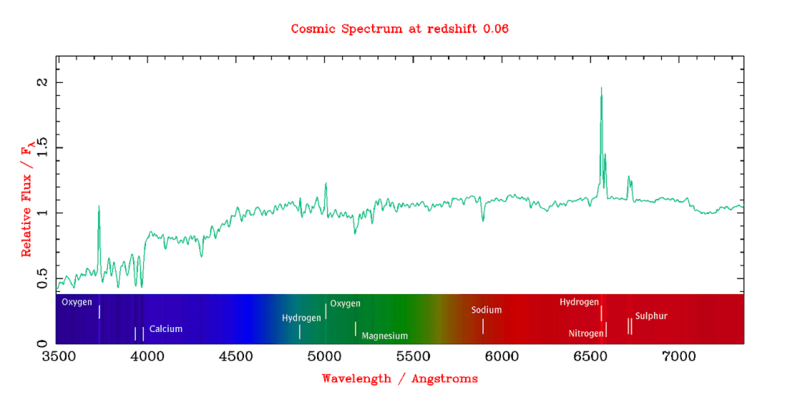 If most stars formed earlier in the universe, then the line spectra would resemble older stars, since most of the present stars would be older. If instead stars formed at a fairly constant rate, then you would see much less bias toward older stars. What we find is that stars haven’t been produced at a continuous rate within the universe. Instead, there was a peak of star production between 6 and 10 billion years ago, and that the rate of production has been declining ever since. Most of the stars we observe are more than 5 billion years old. New stars are still being formed, but the level of star production is nothing like what it was. The universe has shifted into middle age. Of course this just further supports that the universe began with the big bang. A peak of star production is exactly what you’d expect in a universe that begins with raw hydrogen and helium, with each generation of stars releasing some material back into the wild via supernovae and the like, but locking part of the material into red dwarfs, neutron stars and the like. Hints of the big bang in a cosmic rainbow. So our Sun was born after the end of the stellar baby boom?